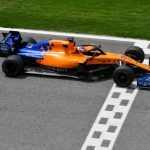 Is Formula One Out of Gear with Vaping Ads? This is the decisive list of the best e-liquids available in 2018. We’ve covered every variety under the sun and even included a special sub-ohm section for all you cloud-chasers. By following our advice and picking up these incredible e-juices from Electric Tobacconist, you’ll never be disappointed with your e-liquid flavour again! Read on for some detailed reviews and links to each of the products listed. What is Actually in My E-Liquid? Before we start, there are just a few bits of housekeeping to get out of the way. We’re going to explain exactly what’s in the e-juice (or e-liquid/vape juice) that you buy, as well as analysing the different compositions of e-juice, including their varied nicotine concentrations. If you’d like to skip this part, feel free to scroll to the products themselves! So what’s in each bottle of e-liquid? Usually, each batch contains 95% glycerin/glycol, then the other 5% contains water, nicotine and flavourings. The glycerin/glycol refers to either vegetable glycerin (VG) or propylene glycol (PG), which form the main body of the e-juice and create their different characteristics. Vegetable glycerin is a natural, organically produced ingredient. It’s thicker, slower to become absorbed into your wick, turns into vapour at a lower temperature and produces large clouds of thicker vapour. Because of this, it is smoother in the mouth and doesn’t cause the same throat hit that higher PG e-juices do. Propylene glycol, on the other hand, isn’t quite as viscous, produces stronger, hotter, less thick vapour, is quicker to wick and will give the user a sufficient throat hit that mimics traditional cigarettes. Because of this, it is more popular among those who a using e-cigarettes primarily as a tobacco cessation tool. The PG/VG ratio should always be studied before purchasing any e-liquid. It is a strong indicator as to the intended use of this product and will help you in buying the right e-juice for the job. Anything with a PG between 40-80 will most likely be for regular clearomizers; for normal, hassle-free, everyday vaping. Higher VG content produces a thicker liquid. It is therefore advised that you use a different clearomizer/coil combination. Otherwise, your vape pen will struggle to wick properly. This considerably increases the chance of you getting a “dry hit”, which is something all vapers loathe! Another very important thing to remember is that some people are allergic to PG. If you have any allergic reactions while vaping, it is important to confirm this allergy with your doctor. Fortunately, there is a great range of maximum VG e-liquids, so this will not prevent you from enjoying yourself while you vape. What Does the Nicotine Strength Refer To? Since the Tobacco Products Directive came into effect, the maximum nicotine concentration (or nicotine strength) in e-liquids produced and sold within the EU is 20% (although many stop at 18%, as it’s easier to produce). To put this into perspective, previous to the TPD, 24% nicotine was the recommended dosage for regular tobacco smokers who were looking for a similar quantity of nicotine to what they had been smoking before. But don’t fear: an e-juice at 20% nicotine is more than substantial enough. With so many people using e-cigarettes as an aid to quit smoking, we wouldn’t want anyone getting cold feet. It is important to remember the addictive nature of nicotine. If you have only ever been a light smoker, start with an e-liquid that has a lower nicotine content, 12% is a commonly used strength. Whereas if you were a heavy smoker, you’ll want to go for the 18-20% bracket. Many vapers try to reduce their nicotine dependencies by lowering the nicotine content in their e-juice over time. This is one of the great features of e-cigarettes; unlike tobacco smoking, where you have to smoke less to reduce your nicotine intake, e-cigarettes let you vape as often as you like, but with a lower or even nicotine free e-juice. 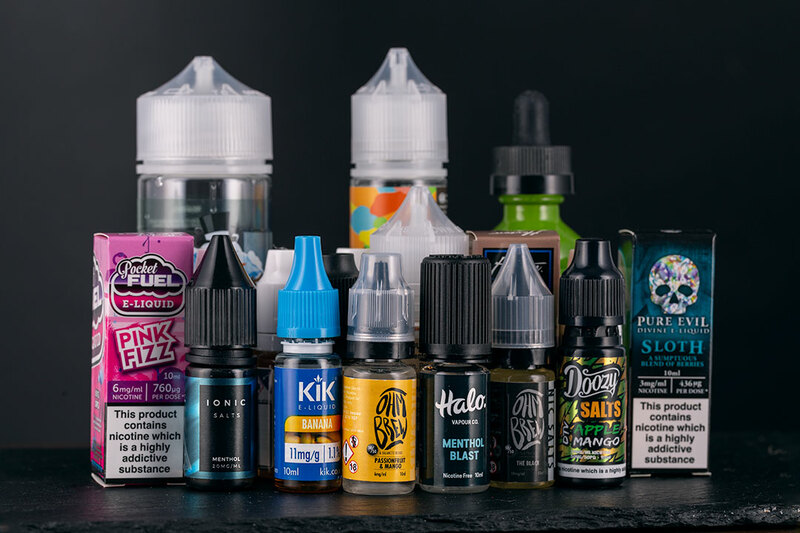 Now that we’ve established the essential components of our vape juices and gained some understanding of which is the right type for us, it’s time to get down to the fun part: flavour! Up next is our 13-category e-liquid roundup. Chosen based on flavour and “vapability”, these 13 e-liquids are amongst the best we’ve ever tried this year and are very deserving of our praise. Putting this list together has been a lot of fun — and the thing that impressed us most was the number of UK producers at the top of their game. A special thank you and well done to them for keeping our industry progressing and innovating. The first nine categories are regular e-juice, mostly for everyday use. Then, the last four are sub-oHm-only e-juice. We’ll introduce you to sub-oHm vaping once we reach their categories. For now, just enjoy thinking about all these amazing new flavours to try! Which is the Best Budget E-Liquid of 2018? No-one is making vape liquid in the UK like 88 Vape. Its approach is simple: the best possible quality at the lowest possible price. What it does well is concentrate on getting it right, rather than trying to impress with the largest range of flavours possible. Because of this, 88 Vape has created a product with an authentic and flavoursome taste. One of the reasons 88 Vape is our favourite budget e-liquid is that it has complete control over its production line. From its purpose-built facility, 88 Vape’s qualified team ensures the highest standards are maintained for every bottle. It even has in-house biochemists to develop flavours. Maybe that’s why they taste so good! Comprising mostly of traditional vape flavours, with a few originals too, the 88 Vape range leaves vapers in admiration. You just can’t get that level of quality at this price. It’s the clear winner of our Best Budget Vape Liquid title. Which is the Best Tobacco E-Liquid 2018? Vapouriz Classic Tobacco is our favourite tobacco e-juice by a country mile. With more five-star reviews than any of Vapouriz’s other juices, it seems that this is not only our choice, but it’s our customers’ favourite, too! Vapouriz are one of the originals, having been founded in 2011, they’ve had plenty of time to work on their flavour recipes and ensure their products are nothing short of excellence. This particular e-liquid has the most success stories associated with those who quit smoking. This only lends further support to the e-liquids wonderful tobacco flavour, we really did find it’s pretty close to the real thing. The balance is PG 80/ VG 20, but it isn’t at all harsh – the flavour is smooth and fragrant and has a warming effect; roasted tobacco comes through brilliantly. Still need convincing? There are over 100 customer reviews for this product, so don’t just take it from us. Which is the Best Gourmet E-Liquid? Ohm Baked are new on our shelves, but their Apple and Rhubarb Crumble e-liquid takes our top spot for Best Gourmet Vape Liquid. There’s a small disclaimer here: this e-liquid is high VG, meaning it’s suited to sub-ohm devices. With that small concession, we feel it has definitely earned its place here. Apple and Rhubarb Crumble somehow blends the prominent flavours of juicy baked apple, tart rhubarb, buttery pastry and cinnamon sugar. It has a nice home-made vibe, with retro packaging and really nostalgic flavour notes. In fact, the whole Ohm Baked range has a grandmother’s cooking feel to it. We found that being sub-ohm actually worked in this liquids favour – the vapour is a pleasantly warm temperature which adds to the freshly-baked angle this e-liquid is taking. We’ve classed it as gourmet as it truly tastes like it – though this liquid is actually a sub-brand of Vapouriz! Which is the Best Fruit E-Juice? 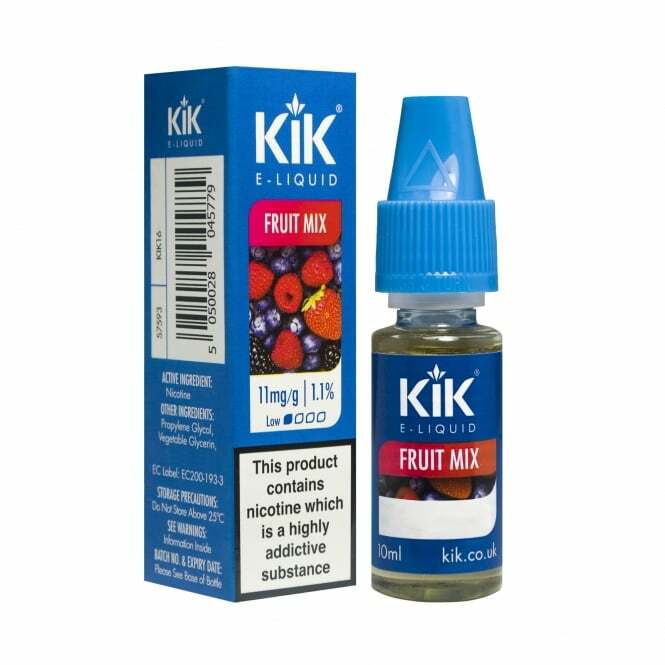 Our Best Fruit Vape Liquid goes to KiK, with its Fruit Mix flavour. A global provider of e-cigarettes and vape liquid heavyweights here in the UK, KiK probably doesn’t need much of an introduction. From its Manchester-based laboratory, KiK produces some of the UK’s most loved e-juices at an incredible price tag of only £1.99 per bottle. Don’t let the price put you off, there is nothing cheap-tasting about the KiK range. Their Fruit Mix flavour really hits the spot if you’re looking for a powerful fruity flavour. With the PG at 80%, this is quite a strong vape, rich in deep summer berry tones. It is, however, by no means overpowering; well balanced and smooth, it never ceases to impress us! This yummy e-liquid is available in every nicotine strength under the sun, from 20 to 0mg. It works well in vape pen and refillable pod mod kits, in particular. 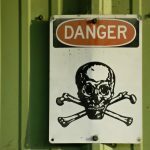 Which is the Best Liquorice E-Juice? 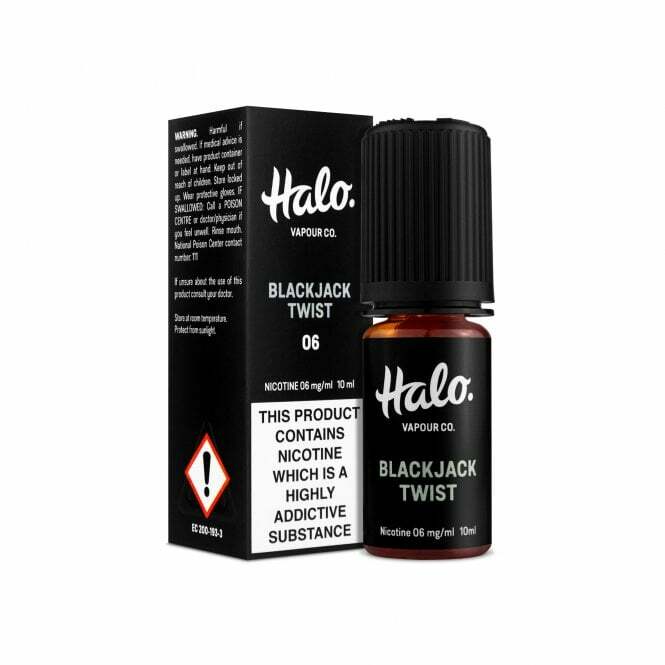 This is a bit of a love-it-or-hate-it kind of category, but the Best Liquorice E-Liquid of 2018 has to go to Halo Vapour Co’s Blackjack Twist e-liquid. Not everyone here at Electric Tobacconist loves liquorice, so as we’re nice like that, they were exempt from tasting this particular product. For many of us, though, it was a great trip down memory lane; the familiar flavours of anise filling your mouth and perfuming the air. Black Jack’s were originally designed in the UK all the way back in the 1920s by a Mr Trebor Bassett. With their unmistakable liquorice flavour and tongue staining goodness, they were immensely popular. 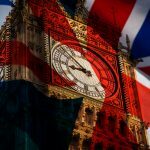 Having fallen out of fashion, the UK’s blossoming vape industry has returned them to their former glory — only this time, you vape them! A standard 50/50 PG/VG split and nicotine strengths of 18mg, 12mg, 6mg, 3mg and a nicotine free option, this e-liquid offers something for just about everyone. Halo has a wide range of flavours, including other retro confectionary flavours such as Bubble Trouble, Pear Drops, and Lemon Fizz. Which is the Best Sweets E-Liquid? Here’s our second old-school sweet flavour and one which had gone out of fashion in a big way. It feels like pear drops have been around since before most of us were born. But like all good things, they come back around eventually. That is why we are really happy to choose VIP’s Pear Drop e-liquid as our winner of the Best Sweets E-Liquid of 2018, as we did in 2017! VIP had, until recently, been a leading producer of quality e-cigarettes and e-liquids within the UK. This pear drop e-juice is a really great day-to-day vape; with a PG/VG ratio of 70/30, it has a full flavour and strong throat hit. In light of recent circumstances, we really hope that VIP get back on their feet and are able to continue to develop excellent vaping products in the future. Which is the Best Menthol E-Juice? In late 2018 we started working with Doozy Vape, a Yorkshire-based e-liquid brand that makes some truly outstanding flavours with a nic salt formula. The whole range is really enjoyable, but they really know how to combine fruit and menthol. Our pick for the best menthol e-liquid in 2018 is undoubtedly Doozy Vape Co’s Frozen Berries. This menthol e-juice is easily the best we’ve tried, with just the right amount of refreshment, fruity flavour and not too much of an intense menthol blast. The mixed berries are balanced brilliantly with the mint to create an e-liquid that you just won’t want to stop vaping. It’s also a PG/VG 50/50 blend, meaning this e-juice is suitable for all regular vape pens so there’s no fiddling about with sub-ohms. Vaped at a regular pace, 10 ml of this e-liquid can easily keep you going for a while! Doozy Vape has a well-rounded and fairly extensive range at Electric Tobacconist. Their collection includes a nic salt range, as well as your typical e-liquids. From blissful like Greek Delight to fruit and tobacco blends, it’s easy to distinguish the quality of this range from the crowd. Which is the Best Soft Drink E-Liquid? Whatever the weather, soft drink flavours are really easy to vape and are the go-to for many. Typically well-balanced and not as sweet as most fruit blends, a soft drink e-liquid is the perfect pick if you’d prefer to opt for a tried and tested flavour combination. Here, EcigWizard’s Blue Slush takes the medal, from their delicious Slushy Hut range. Blue Slush is flavoured with Blue Raspberry, a man-made concoction that calls on a special type of Raspberry (it’s called the Rubus leucodermis, no need to try and pronounce it), a touch of sweetness and some blue colouring. If you’re wondering if you’ve ever tried it or not, the answer is likely yes; the blue slush drink you buy at the cinema is flavoured with blue raspberry. Most sweet that are blue in colour? Blue Raspberry. The flavour has an interesting history stemming back to the ’70s. The flavour has a wonderful smooth fruitiness along with a small dash of menthol. It’s part of Ecig Wizard’s more extensive range of e-liquids which consist of a mix of nic salts, standard e-liquids, sub-ohm liquids and short fills. What’s not to like? Which is the Best Wild Card E-Juice? The clue is in the name here: it’s funky, and not in a bad way. Picture chocolate, which is delicious – banana, which is creamy and mellow, and add a touch of… aniseed. That’s right! Vampire Vape’s Funky Monkey sounds like it could go terribly wrong, but it somehow tastes very, very right. You really have to try it to believe it, but this e-liquid has received 5-star reviews on all fronts. Vampire Vape is one of the oldest e-liquid brands around and has an extensive range of flavours. There is a Vampire Vape e-liquid for everyone! We fully expect some people to skip this part and head straight for the e-juice reviews. But we so often hear people ask about sub-ohm vaping like it’s a strange and mysterious thing, so we’d like to clue a few people up on just how easy it is to do. Box mods and sub-ohm vaping are a lot more straightforward in 2019. Advances in technology since 2010 have enabled sub-ohming to become commonplace. A wide range of ready-to-vape mods are available over the counter, with very little specific knowledge required to use them effectively. Nonetheless, you want to be able to explain why it is that your new sub-ohm vape pen is capable of producing all that vapour. The primary function of sub-ohm vaping is to produce larger clouds of vapour. To do this, we have to increase the power to our coil. The more power going through the coil, the more vapour it can produce. However, if we continue to add more power, the coil will eventually get too hot and burn our vapour (not good!). To prevent this, we do two things: reduce the resistance of the coil and increase the airflow to help cool the coil. Lowering the resistance works much like increasing the space in which the electrons can move. For example, if you doubled the thickness of a wire, twice as many electrons could pass through than in the original wire. Essentially, you’ve halved the resistance — hence the name sub-ohm vaping, because the resistance of the coil is below one ohm. This lower resistance combined with increased battery power and more airflow helps to produce more vapour. Sub-ohm vaping also gives you more control over your vaping experience. Most modern devices will come with variable wattage and variable airflow options. As explained above, increased wattage will apply more power to your coil with the intention of creating more vapour. But it’s not quite as straightforward as that. Don’t just ramp up your Watts straight away; get used to how your coil works at various degrees of power (the same goes for airflow). Start low, where you have more control, then increase the power/airflow until you’re happy with your vape. It’s no good producing huge clouds if they taste a bit burnt, or you empty your tank in seconds. It’s important to remember that box mods and sub-ohm tanks are often the best-made vaping devices available. Because of this, the quality of the vaping experience can be greater, regardless of how much vapour you are trying to create. Also worth noting is that sub-ohm vaping does use more e-liquid, often using larger wicks to absorb more vapour, plus more power for longer tokes. So don’t be surprised if you find yourself getting through your e-juice faster than usual. 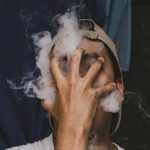 So there you have it: a brief guide to sub-ohm vaping. We hope it helps you to understand our four sub-ohm-only e-liquid categories that little bit better! If you haven’t tried sub-ohm vaping yet, you really should. It’s great fun and brings so much more choice to the table. Which is the Best Sub-ohm Fruit E-Juice of 2018? Starting off our Best Sub-ohm Vape Liquid selection is the Fruit Flavour winner. 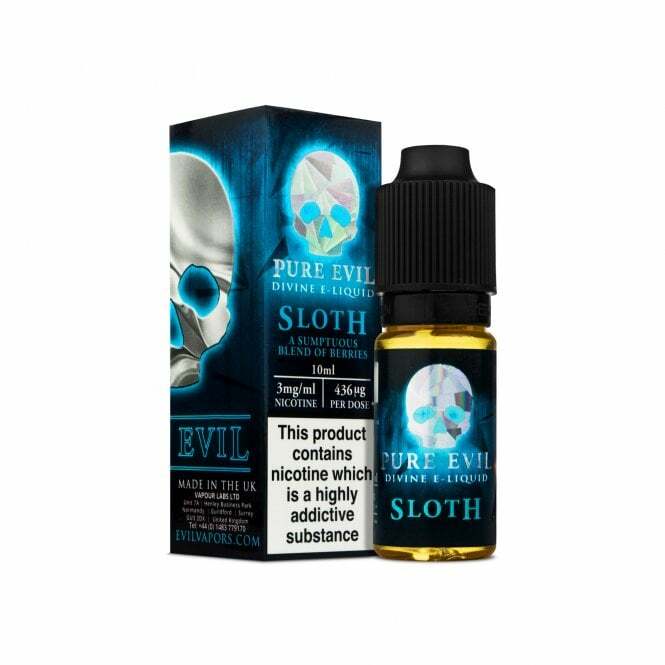 This goes to tried and tested Pure Evil e-liquid range – Sloth is described as a sumptuous blend of berries, we couldn’t put it better ourselves. The focus here is on big, broad berry flavours which carry well through the incredible vapour clouds this e-liquid can provide. Check out the product page to see some of the reviews our customers have left for Sloth. This is what sub-ohm vaping is about and this e-liquid really doesn’t disappoint. Our Best Sub-ohm E-Liquid categories still include the sweeter, dessert-based e-juices, but it’s always good to have a few fresher, lighter e-juices around, too. Which is the Best Sub-ohm Milkshake E-Liquid? And the winner is… Hoxton Sub Ohm Strawberry Milk. Let’s be honest, strawberry milkshakes are outrageously good. Fortunately, this vape juice really hits the spot, with a strong and summery strawberry flavour, then the well-known creamy flavour of vanilla milk and ice cream coming through afterwards. At £10.00 for three 10ml bottles (which can be mixed and matched with any others in the offer), this is a very competitively priced e-liquid. Many 100% VG juices cost around £4.99. We also really love the packaging and the fact that Hoxton has branched out into making sub-ohm options. Having tried them all, the team here at Electric Tobacconist voted Hoxton’s Strawberry Milk as the most popular flavour. As this is a 100% VG e-juice, special care must be taken. This will only work in a sub-ohm tank and you may need to pay extra attention to the wicking process. This e-liquid is thicker, so the wicking material, therefore, takes more time to absorb it. To avoid dry hits, this e-juice is not recommended for people who chain vape. Instead, it should be used for deep, intense hits of strawberry milkshake goodness. Which is the Best Sub-ohm Cocktail E-Liquid? The Best Sub-ohm Cocktail E-Liquid of 2018 had to go to Pocket Fuel. 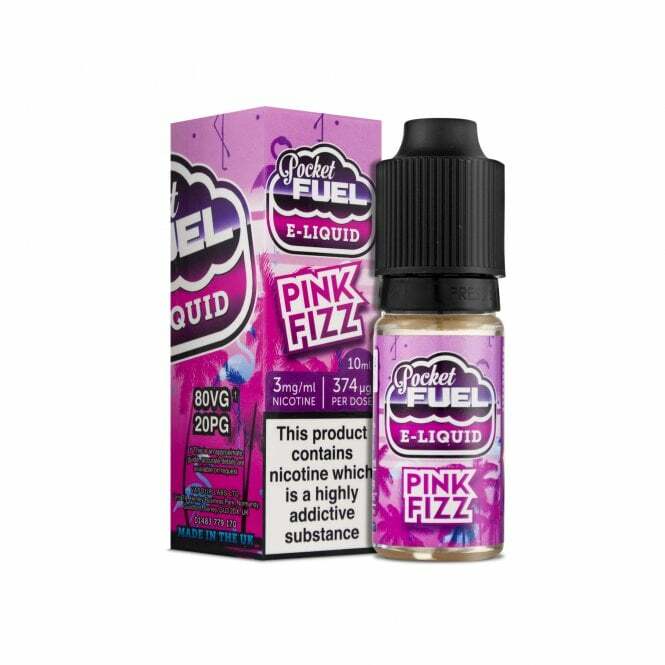 Its Pink Fizz e-juice is classy and original. We were originally attracted to this particular e-liquid because it really sounded like a fizzy beverage we’d love to try. The flavour is designed to be a mock-up of pink champagne, which obviously is alcoholic, but Pocket fuel adds the gently acidic kick by using a dash of citrus and it works wonders. You can almost taste the bubbly champagne fizz! Pocket fuel has a whole range of colourful flavours to try. They’ve loaded each and every one with gallons of flavour, making them ideal for sub-ohm vaping. They also produce quite the cloud, and they smell incredible. The flavour profile isn’t overpowering – but it does have a refreshing bite, so we’d definitely recommend it as your day-to-day sub-ohm e-liquid. It has an 80% VG content, meaning it’s a very dense and thick liquid. You’ll need to ensure your device is compatible to avoid potential wicking issues. 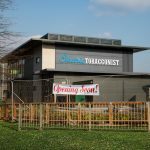 These unique flavour blends are adding further to the healthy, versatile growth of the UK’s vaping industry and its products. It’s really quite impressive. Which is the Best Sub-Ohm Dessert E-Liquid? You can’t start a dessert e-liquid competition without the team at Dinner Lady. Its range of old school desserts/baked goods e-liquid flavours is exceptional. Since its conception, we can’t get over the nostalgia of the Dinner Lady Lemon Tart e-liquid. This used to be served as a pudding when we were kids and ate school dinners. It’s been years since we last tasted this delicious pud, Dinner Lady has really nailed the flavours of sweet buttery pastry and tangy lemon curd. Those of our team who are old enough to be fans of jam tarts and lemon meringue pie were extremely excited about trying this sub-ohm e-liquid. Cries of “I haven’t tasted one of those in years” could be heard across the office. One team member even had a story of an old bakery deep in the suburbs of Bristol, where he enjoyed the best fresh lemon tarts being served and had promptly bought four… Unfortunately, that bakery closed down, but now he can relive it through the wonders of vaping! This e-liquid is shortfill, meaning it’s nicotine free to start with and has more e-liquid inside (50ml). Don’t be put off by the £14.99 price tag; this is the equivalent to 5 bottles of 10ml e-liquid. You simply need to add a nicotine shot to up the strength to your desired level. We guarantee you’ll enjoy every last drop of this juice. A slightly higher PG/VG ratio here at 20/80 serves to really hit those flavours home. It’s rich and powerful, but also smooth and enjoyable to vape. Suitable for everyday use, you’ll have everyone wondering how your new e-liquid smells that good. We’d love to get everyone to enjoy a sub-ohm vape, so we hope our list of great sub-ohm flavours helps you get your head around everything. It’s not just about making huge plumes of vapour; there’s often a lot more choice involved in sub-ohming. Current box mods offer a wealth of technology to help you personalise your vape experience. Because of the larger batteries in a vape mod, you get to enjoy the benefits of temperature control, adjustable wattage, better build quality and extra customisation. Ultimately, sub-ohm vaping is about being about to choose exactly how you want to vape, but you get a better flavour and quality of vape, too. While it might seem like an overly technical style of vaping, you’d be surprised by how straightforward it can be. The Innokin Cool Fire Ultra is a leading model of box mods, filled with the quality components and excellent batteries, you can enjoy its fantastic vape quality all day long. While they may require a slightly larger investment, we’ve found their better build quality means they last longer than regular e-cigarettes. We realise not everyone wants to sub-oHm vape 24/7, but there’s a solution to that, too. To attach the tank to the mod itself, you must screw it on. Most mods use a 510 threaded connection, so if you make sure both your box mod and your tank are 510 compatible, you can attach a tank that uses higher-resistance coils. Just remember to use a lower wattage if you’re using a coil with higher resistance and not to use sub-ohm e-liquid, else your coil won’t last very long! With an absolutely massive selection of vape liquid in the UK, find your favourite flavour at Electric Tobacconist today — with free delivery over £10! Published April 5th, 2017. Updated January 17th, 2019. I have been using 88 Vape for a long time. its good! Great Site, Continue the beneficial work. Thank you! Best Menthol? Vapour2 Bold Leaf Menthol E-Juice – the best eliquid I’ve ever tried. Strength 2,4% (I know I know… I’m trying to get to 1,2%). Tobacco undertones make this flavor unique. It’s a pleasure to smoke it. You feel fresh but it still satisfies your „tobacco hunger“.